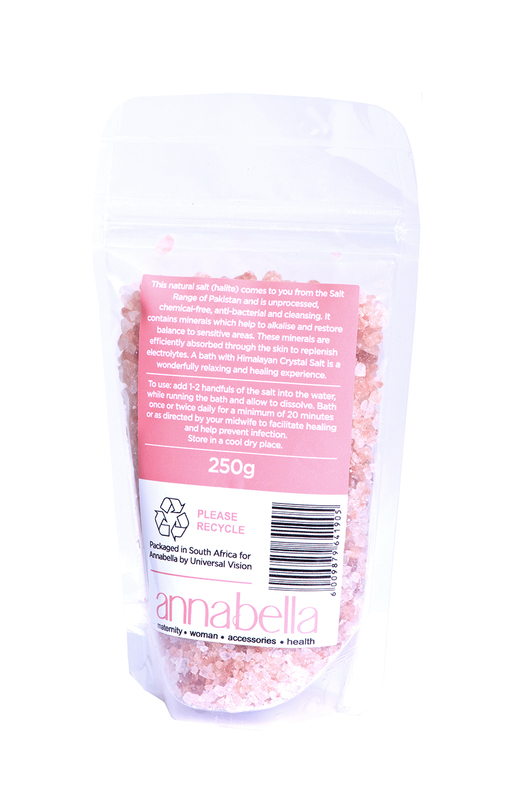 Annabella Himalayan Healing Crystal Bath Salts is a perfect solution for post-birth bathing, as it helps to facilitate and enhance the healing process. This natural, unprocessed, chemical-free salt is anti-bacterial and cleansing . It contains minerals which help to alkalise and restore balance to sensitive areas. These minerals are efficiently absorbed through the skin to replenish electrolytes. A bath with Himalayan Crystal Salt is a wonderfully relaxing and healing experience. Add 1-2 handfuls of the salt into the water, while running the bath and allow to dissolve. Bath once or twice daily for a minimum of 20 minutes or as directed by your midwife to facilitate healing and prevent infection. The Himalayan Salts come to you from the Salt Range of Pakistan. This natural salt (halite) was formed around 250 million years ago through a crystallization of the salt that remained from the evaporation of primordial sea water during the formation of the Himalayan Mountain Range. Packaged in South Africa for Annabella by Universal Vision.